She is the second offspring of Surprise! L-86. She was full of energy. We got a chance to know her. She and Pooka were very playful. With family and pod mates. She and her brother could really make you laugh. We last saw her on October 21, 2011. It's not known how she died. It may take a while to find out. An answer may never be revealed. It's so very sad to have lost her from this fragile Community. 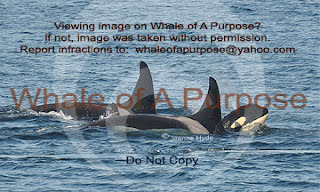 She was one of only two females born in L pod between 2003 and 2009.
of bringing offspring of her own into this world one day. Her death has changed her role. She will now be a teacher. and 'whale huggers' young and old. Southern Resident Community there is time to prepare. 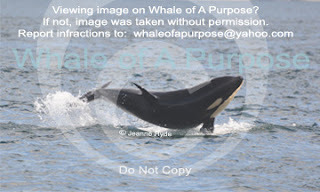 Usually, at first, a whale is not seen during an encounter. 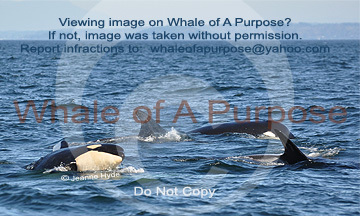 Then, during the next encounter, all eyes are looking for that whale. 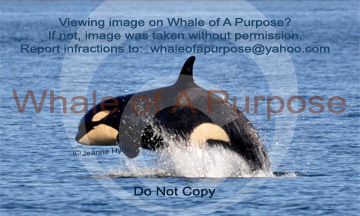 a whale may be listed by CWR as missing. In the winter L pod is not commonly seen in the inland waters. 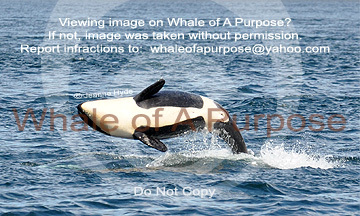 Sometimes L pod shows up off Monterey Bay, California. It is standard to wait until spring for L pod's return. It is then we look for the presence of every member. Sometimes it takes weeks to locate each member. Sometimes only a few days. 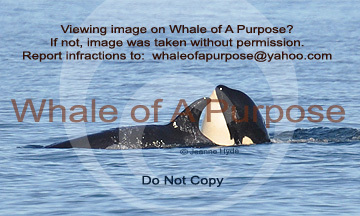 It's not known how Sooke died. There are enough scenarios to keep one awake at night. But wait we must, for the test results. Sooke's skeleton will come to reside at The Whale Museum. link here and scroll down on their home page. we each will have changed from this significant event. I only hope that her death will not have been for naught. 2-6/7-12 Sonar in Haro Strait - Again! Read this: compiled by Scott and Jason of the Orca Sound hydrophone system regarding this current sonar incident. 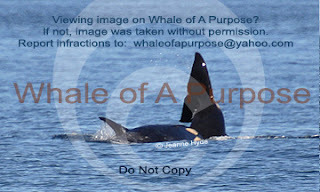 ...by mid afternoon I was zooming my way to the other side of the island to try to catch a glimpse of some whales! ...that was until I saw the gulls...and then a blow! Yes! there they were! February 6th - Night - 10:15 pm. 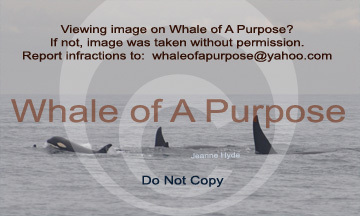 end of year note 2012: of these 13 whales 3 went missing in 2012. Why? there is no answer...it is just curious that it would happen in that manner. These groups of whales were known to spend time together.